There is nothing stable in this life. Everything is constantly changing and improving leading us to more comfortable lives. This pleasant fact definitely has to do with the doors we are providing. Nowadays expensive and massive doors are becoming less and less common. They are replaced by other types of entry doors – less expensive, but more efficient at the same time. So what do we offer? These are insulated fiberglass and steel doors for the homes in the area where really cold weather prevails all the year round, like Toronto and Greater Toronto Area. So these doors ensure effective sound and heat insulation, they are also less expensive and require a very low maintenance. Our doors combine the durability of steel entry doors and the touch of woody doors providing the best performance. So, What You Should Know about Our Entry Doors? Our entry doors are constructed in compliance with the laws of solar-heat gain. Thus, they are able to reduce heat loss in cold weather and limit solar-heat gain during hot sultry summers. These doors can be supplied with transom windows and insulating frameworks. The quality of our entry doors is aimed not just at satisfying the requirements of universal standards, but also at surpassing our customer’s expectations. The designs of our entry doors are always fashionable, trendy and up-to-date. We are offering different options and varieties of patterns, so to satisfy any tastes and wishes. We use slabs in manufacturing, so we can say for sure that our entry doors are really durable and genuine, free of any toxic substances. We also provide our customers with adjustable thresholds meeting their wishes and requirements. We offer custom-made exquisite entry doors, so they are customized to the required shapes and sizes, as well as to customers’ wishes and ideas. We are constantly working on developing and improving our entry doors manufacturing to please our dearest customers. Since you install our entry door there is no need to worry about heat loss or gain, as all our doors are provided with efficient sound and heat insulation, which is in running order the whole year round. Our doors are weather-resistant and that is why they are indispensable assistants in every season. They are the best choice of exterior types of doors. We provide really sophisticated and unique designs together with the best quality ever. We are striving at satisfying all our customers, which is our main objective. So we are working hard on improving our manufacturing, creating new designs and finding new ways to accelerate the process of production. We are extremely happy when our customers are pleased and receive what they really expected. 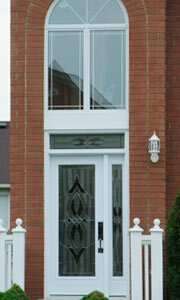 Select from Fiberglass Doors, Steel Doors, French Doors, Sliding Patio and Garden Doors. Request a free, in-home Consultation Today.